Monster Hunter: World is chock full of fun given its potential for multiplayer shenanigans. Yes, its battles are epic—hunting down fearsome monsters takes patience and discipline. But you know what else is great? The music which scores its brilliantly strange world, and its collection of crazy monsters’ theme songs. Monster Hunter: World is my latest attempt to challenge myself by playing more multiplayer games and trying different genres. 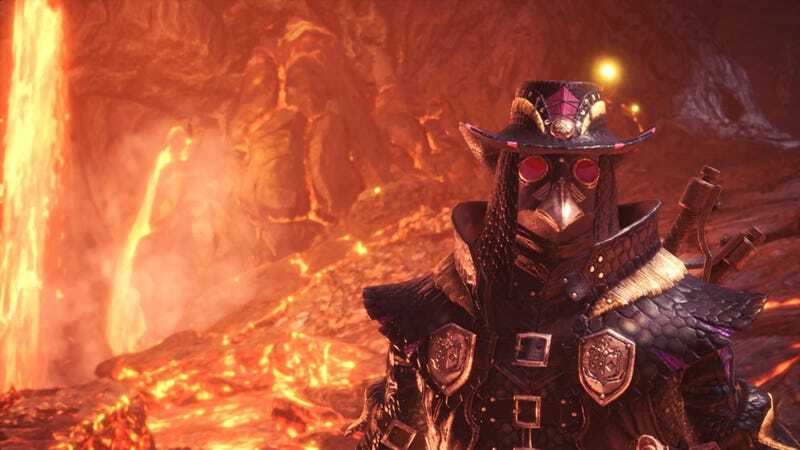 It’s my first Monster Hunter, and each hunt in the action-packed adventure has been a learning experience. There are so many menus, lists upon lists of quests to unlock, tons of crafting items, armor sets, and weapons—it can all feel overwhelming. From the mysterious, colorful Coral Highlands to the deserts of the Wildspire Waste, there’s a lot to take in. Most maps are not just another stock video game locale—even if World has the tried and true lava pits and jungles that we’ve seen in countless games. These environments are rich in details, with parts that can be utilized to a hunter’s—and prey’s—advantage. They’re interesting and stunning. When I first arrived in the Rotten Vale, I hated it. It’s a gross visual amalgamation of rot and decay. Icky red fleshy areas, drab browns and grays dominate its caverns. Uninviting sickly yellow and green toxic gases permeate in various areas. Smaller monsters and insects living there are aggressive. There are areas deep below the Rotten Vale that are beautiful and bright, with pools of what appears to be crystal blue water. They’re in stark contrast to its bone piles and corpse-laden grounds. It’s a deceptive respite as the liquid pools will eat away at your health on account of their acidity. Frankly, any watery area that doesn’t indulge of fishing mini-game obsession is a bad place as far as I’m concerned. I spent a lot of time in the vale, farming Great Girros for his armor set. There was one curious thing that delighted and caught my attention in that god-forsaken place: the comical battle music that plays. This gigantic beast, an undead elder dragon, able to summon a legion of undead lesser monsters to him, was a sight to behold. World does an awesome job of introducing its larger monsters with its cinematic cutscenes, and I was enthralled and amused by his torn flesh that oozed and dripped off his body. A zombie dragon? I was convinced I would surely die. A lot. Vaal Hazak’s theme begins with a slow build layered over frantic emotion. 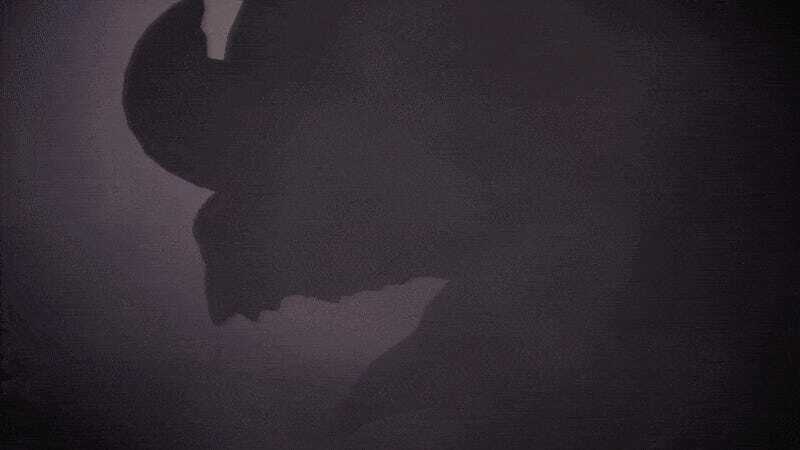 It’s an introduction befitting a formidable foe—meant to instill that fear. It’s preparation before launching into a full on frenzied score. At 45 seconds, it gives way to a thoughtful composition. Gone were the comedic midi tunes of fighting lesser Rotten Vale monsters, replaced by elegant gothic harpsichords to underscore its quieter moments. 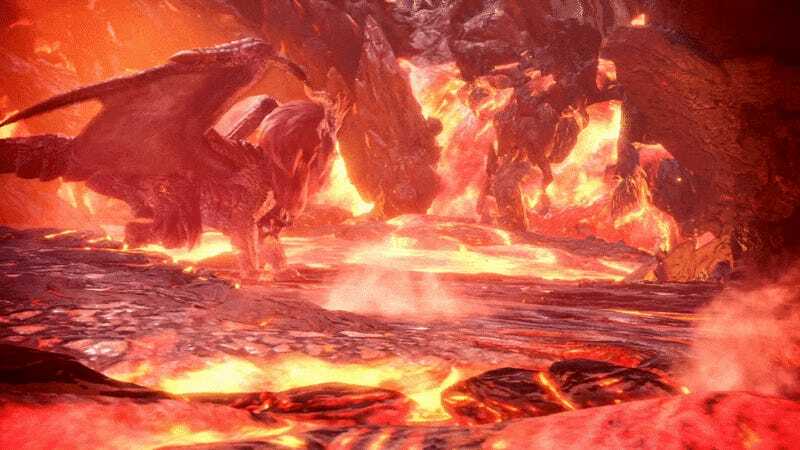 These quiet moments read as a hunter gaining the upper hand in a fight but it’s a short breather before the furious, dreadful notes return as a reminder that Vaal Hazak’s might is humbling. I’ll just come out and say it: The Elder Recess is my least favorite area in the game. I enjoy World’s maps for their cool takes on the traditional representation of video game locales. The Wildspire Waste’s desert, for example, has a swamp populated with purple flowers that holds fresh aquatic life. It’s not all stretches of sand and a refreshing oasis. It’s more realistic. The areas in the game feel lived in and untamed, where the creatures truly own their habitats and as hunters, we’re an invasive species. Unfortunately, Nergigante ends up in the Elder Recess near the end of the game. But as he has a very good storied reason as to the why—which I won’t say but if you know, it’s morbidly funny—I forgive him. 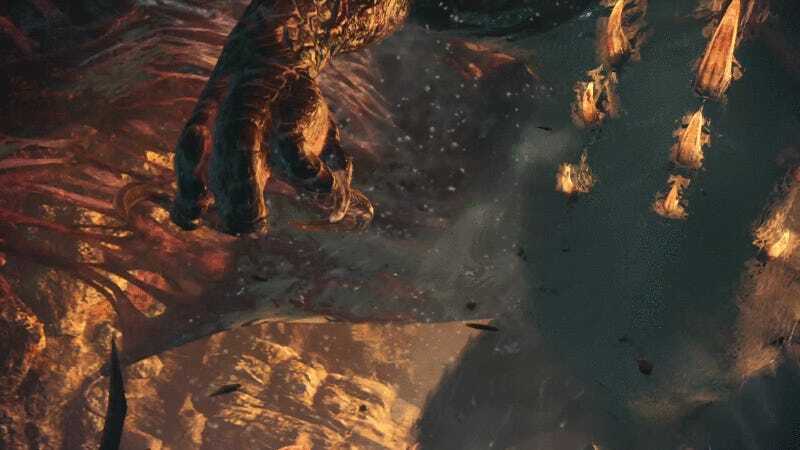 The Elder Recess’ expansive, sparse areas where Nergigante can initially be found means that he has full advantage in battle. It gives him range to tear the place up and launch high speed attacks that can blindside you (which he did to me, of course. Many times in my failed attempts at beating him). His erratic behavior (which, as with any monster in World, isn’t so erratic once you’re able to recognize their fighting patterns) has an erratic theme to match his speed-demon personality. I don’t think I enjoy the opening notes of any other theme in World more than Nergigante’s “Even Elder Dragons Tremble”. It’s all over the place that then leads to triumphant sounds. But are those in favor of Nergigante or you? What follows is a build up to a long, drawn out fight. But unlike Teostra’s steady, focused rhythm, Yuko Komiyama’s Nergigante theme feels like an up and down struggle. A push and a pull that’s a battle of wits, constantly teetering on victory or defeat. It even incorporates, very briefly, Monster Hunter: World’s main opening theme. As if to say: this is what you’ve been striving towards. All the hours poured into the game for this moment. Are there monster themes you love? Share them below!